The cyber world is full of self-made successes who began with nothing but an enthusiasm for computers, and we want to help write more of those stories. Code Partners—the only coding bootcamp in Montgomery County, Maryland—now offers scholarships that will pay for up to 70 percent of tuition for our Code 201 class. Women, U.S. military veterans, and populations underrepresented in technology are all eligible to apply for these scholarships, which are generously funded through the EARN Maryland grant program. Scholarships will be awarded based on Maryland residency, financial need, and the applicant’s ability to meet entrance requirements. No prerequisite classes are required—however, to prepare for the entrance quiz, Code Partners offers Code 101 and Code 102 courses. Our inaugural Code 101 one-day classes, held in Bethesda, attracted good attendance, and our instructors received excellent reviews. The one-month, Code 201 course starts May 14 at the Ana G. Mendez University System campus in Wheaton, within walking distance of the Wheaton Metro station. DAI has been excited for years about the inclusiveness of coding as a career and the potential of coding as a jobs creator. 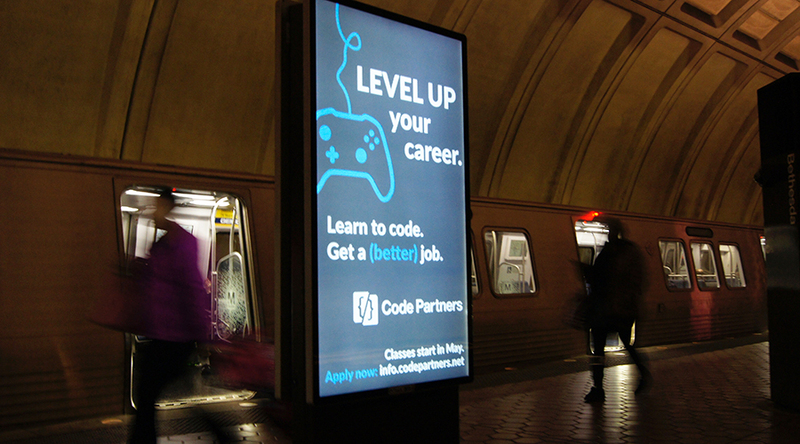 That’s why we teamed up with Rockville, Md.-based United Solutions to launch Code Partners. Our instructors teach code from the ground up, with a focus on applying this practical skill in real-world scenarios. We encourage anyone who wants to see “behind the computer curtain” to take the 201 class, which is based on the proven curriculum developed by Seattle, Wash.-based Code Fellows. Students can advance to the 301 level, which prepares them to perform web development, and on to the 401 level for aspiring software engineers. DAI has embraced the Code Fellows model because our mission in developing countries includes helping to create long-term jobs. Information and communication technology (ICT) is a sector ripe for job growth around the globe. While Code Partners will help local people start their coding careers, we also hope to apply this model in developing countries. Why? Because a rich and effective ICT ecosystem better positions developing countries and their citizens to create jobs, drive economic growth, and increase self-reliance. A degree from MIT or experience in Silicon Valley is not required to learn coding—only an interest in how computers work. If you have ever thought about a career in technology and you’re attracted by the idea of a skill that seems set to be in high demand for the long haul, we encourage you to learn more about Code Partners and the scholarships now available.